Since its inception in 1961, Gold Mercury International has focused on advancing global governance and promoting visionary leadership. In today’s globalising world we are faced with an increasing number of issues and problems that defy state boundaries and go beyond the capacity of any single individual or state to resolve. These issues need to be addressed through processes of sustainable global governance and Visionary Leadership. We believe the work of Gold Mercury International has never been so vital. These Awards are primarily designed to recognise and honour the remarkable individuals who share our values and who have made significant contributions in finding solutions to the most pressing issues of our time. In doing this, and in bringing together visionary leaders from around the world, the Awards foster cooperation and understanding of shared problems and triumphs at an influential and global level. Over the years, the Gold Mercury Awards have been able to count humanity’s best and brightest amongst the ranks of its Laureates. The future Awards intend to remain true to this legacy. 1.1 The Gold Mercury Awards categories and their respective criteria have been developed by the Award Organising Committee. These categories are endorsed by 8 corresponding Award Expert Committees to ensure that they adequately reflect the distinguished legacy of the Awards, follow the core ideals of Gold Mercury, and fit with its objectives of developing sustainable global governance, ethical leadership and promoting peace, understanding and cooperation throughout the world. 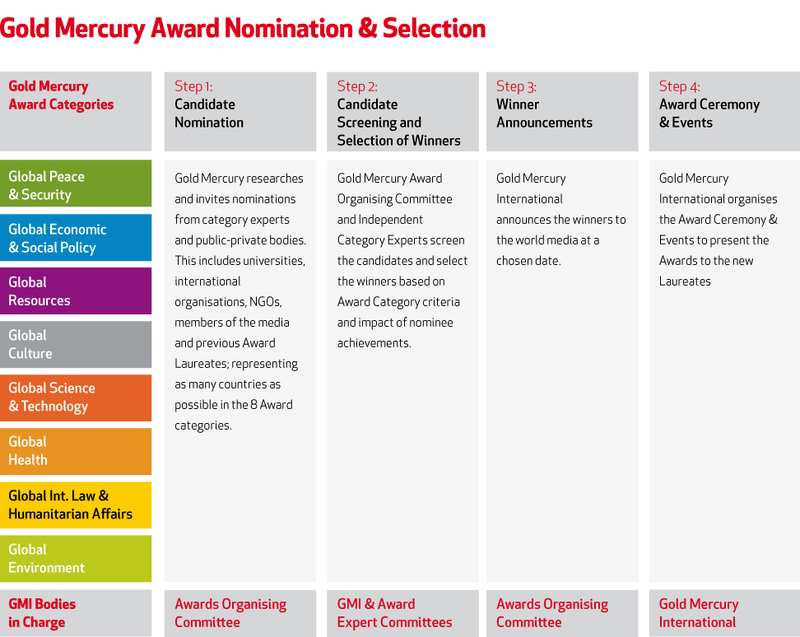 JANUARY–APRIL – Gold Mercury researches and invites nominations from category experts and public-private bodies including universities, international organisations, NGOs, members of the media and previous Award Laureates; representing as many countries as possible in the 8 Award categories. APRIL–JUNE– Review of candidate nominations by the Gold Mercury Award Organising Committee and the 8 Award Expert Committees. Selection of Award laureates. SEPTEMBER – Award Laureates are formally announced to the media. SEPTEMBER-DECEMBER –Award Presentation Ceremonies & Laureates Lectures. 3.1 Award candidates may include any individual or organisation that has achieved excellence in one or more of the Award category areas. This may include (but is not necessarily limited to) world leaders, scientists and researchers (including teams), social innovators, international organisations, businesses, non-profit organisations and NGO’s, individuals, administrative or government bodies and unions. 3.2 The Awards will be open to recognising specific achievements throughout the preceding years as well as recognising continuous, aggregate or culminating achievement dating from and continuing into the Awards year. 3.3 No current or previous staff of Gold Mercury International nor any member of the Gold Mercury Organising Committee, nor members of the Award Expert Committees are eligible for nomination. 3.4 Self-nomination is not permitted. 4.2 Nominations for proposed candidates must be submitted during the nomination window, with supporting evidence of the Nominee’s achievements. 4.3 Confidentiality: The names of nominees and other information about the nominations will be maintained as confidential, at all times. – The Award Organising Committee, which is in charge of the management of the Award. The 8 Award Expert Committees advise the Award Organising Committee on the selection of the Laureates of the Award in each category. The Award is managed by the Award Organising Committee, which is chaired by the President & Secretary General of Gold Mercury International and supported by Gold Mercury International’s team of researchers. 6. Announcing the Winners of the Award. To each of the 8 Award categories corresponds an Award Expert Committee composed of Gold Mercury International board members and international experts in that area. Each Award Expert Committee advises on the submitted nominations for their specialty, and advises the Award Organising Committee in their respective area. 6.1 The Gold Mercury Award will consist of the historic Gold Mercury sculpture and the Gold Mercury Diploma. 6.2 The Laureates attend the Award Ceremony Events and Gala Dinners to receive the Awards. 6.3 Laureates take part in the various events organised around the presentation of the respective Award ceremonies. These include a Laureate Lecture, meeting dignitaries, VIP’s, the press and other promotional events related to their Award and achievements.